In Microsoft Windows, starting from Windows XP, there is a built-in ability to set up network ports forwarding (port forwarding). 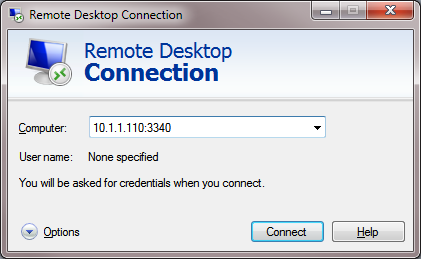 Due to it, any connection coming to any port can be forwarded to another local port or even to port on remote computer. Not necessarily that the system has a service listens on this port. Suppose, that our task is to make the RDP service to respond on a non-standard port, for example 3340 (the port can be changed in the settings of the service, but we will use RDP to make it easier to demonstrate forwarding). The connection should be established successful. Important. This forwarding scheme works only for TCP ports. You won’t be able to forward UDP ports this way. Also you can’t use 127.0.0.1 as connectaddress. Another portproxy feature is an opportunity to make it look like any remote network service is operating locally. Now if you go to http://localhost:5555/ in your browser, CNN Start page will open. So despite the browser addresses the local computer, it opens a remote page.